| Untangling the Web | "It's like giving directions to your house. The site is a map for getting found." specialty, procedure and region. Its goal is to help prospective patients ﬁnd doctors via the manner in which consumers typically conduct a web search—by the procedures they are interested in and by locale. "It's like giving directions to your house. The site is a map for getting found," says Michael Dougherty, owner of TopDocs. The site charges $50 a month for a listing, and Dougherty notes that the search features are most effective for doctors based in less hotly competitive marketplaces when compared to major metropolitan areas. A third category of websites that can be valuable to physicians who offer elective procedures is procedure-speciﬁc sites. One example is Liposuction.com, which offers a physician ﬁnder as well as a wealth of information on liposuction procedures. Doctors pay an annual or monthly fee to create a customized proﬁle on the site. As part of the fee, members gain access to a variety of ROI tracking tools, including lead reports to help measure lead generation and followup with patients obtained through the site. Members also receive "Lead Alerts" when patients inquire about their services. The Patient's Guide (patientsguide.com) manages 25 procedure- and concern-speciﬁc sites related to dermatology and plastic surgery. The sites offer participating physicians the opportunity to create interactive proﬁles as well as to post videos, beforeand-after photos and ofﬁce photos. The company charges a performance-based fee rather than an upfront, ﬂat fee. To Pay or Not to Pay? Responding to Online Reviews Almost every site mentioned above—particularly those that offer free listings to practice owners— also offer the option of paid advertising. Like Google Ads, a paid advertisement pushes you to the top of the list in directories and posts 38 your contact information when patients view information on certain procedures. As consumers grow more sophisticated in terms of how they use the Internet, they look beyond the paid ads, says Cam Lay, senior director of businessto-business marketing for Yodle (yodle.com), a local online advertising company that seeks to connect local businesses with consumers. "Consumers are becoming more savvy," he says. "They understand that those initial listings are paid ads." Still, he advises using some paid ads to boost leads. "People who click on ads tend to be much closer to the buying stage," says Lay. "With a paid ad you can be up in a short amount of time. Rising to the top of an organic search takes longer. We recommend clients do both." Prices for ads on review sites vary greatly. "If you are doing breast augmentation in Beverly Hills, that's a very competitive market," says Lay. "The click prices would be much higher. 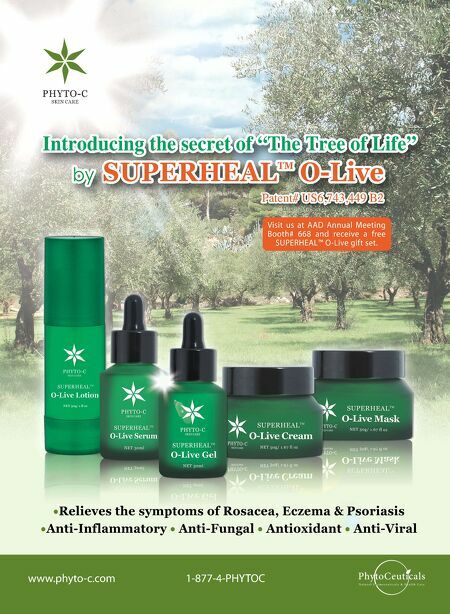 They are based on where you are and what procedure you want to promote." For consumers, review sites are valuable tools that help them research a variety of businesses before they book an appointment. For physicians, anonymous online reviews can be a doubleedged sword. 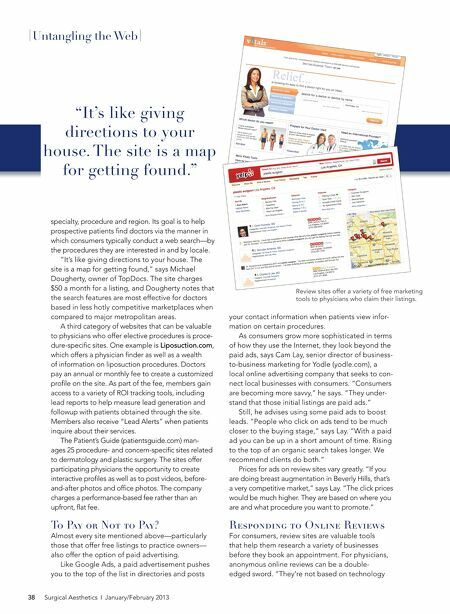 "They're not based on technology Surgical Aesthetics ❘ January/February 2013 Review sites offer a variety of free marketing tools to physicians who claim their listings.